Headlines Flyfishing has been fantastic in the area this week and some great bait fishing too. Rivers:- Had been firing with the warmer weather and some good hatches happening but the rain of the weekend made the fishing a little tougher. Anglers have still caught fish despite rising water levels. It should have all settled down by the weekend with any luck. Lake Eucumbene:- Despite having dropped over the past couple of weeks the lake is firing! Plenty of good fishing with large numbers of fish being caught right through the day. Evening rises have been spectacular in some areas though many of the fish are smaller rainbows. There is a good class of 40ish cm rainbows that are in great condition. Browns have been a little hit and miss but there are some nice conditioned ones turning up for those polaroiding or throwing larger streamers or beetles. Midge have started to show a little more in the past week with a few reports of fish on balling midge at times.m They are not everywhere at this stage so searching bays till you find some is necessary. Beadhead nymphs fished quick or a small black and peacock, stick caddis, or midge pupa fished slow are great searching patterns for the rainbows. Small emergers on dark will undo some of the fish that are on adult midge or emerging midge. Beetles, yabbies and dragon flies have also been on the menu. *Vic Kowalski from Queanbeyan had a couple of good sessions over the past week catching one nice brown on each trip and a few rainbows. Both the browns were over the 2kg mark. Woolly buggers and small wets worked best. Lake Jindabyne:- Jindabyne reports have been stories of plenty of midge balling and on the wing around the edges but very hit or miss on fish feeding off the top. One day may fire and the next at the same spot is dead. Water temperature should have dropped a little with the cooler days and rain this week and may bring the lake back online with more midge feeders. There have been good numbers of fat little brook trout around this season and now would be a good chance to catch one of these pretty little fish. Eucumbene:- Eucumbene trolling reports have been quiet but there would be some nice fish to catch on tassie devils behind leadcore or on a downrigger at the moment. Flat line Deep diving minnows like the Merlin ultra deeps will be great options for some browns and the little Stiffy devilfish vibes, RMG scorpions and rapala 4cm Xraps ideal for the rainbows. Jindabyne:- Trolling reports have been quiet also, but the downrigging will be fantastic at present. We have mudeyes in stock at time of writing. 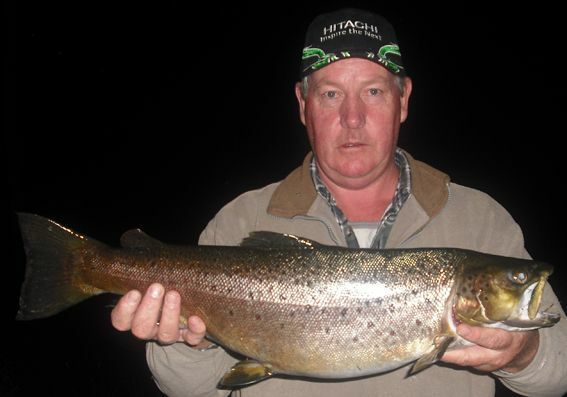 *Mick Osbourne from Captains Flat caught this 3.1kg brown on red powerbait in the Middilingbank arm recently. A very nice fish indeed.